Installation of anaerobic digesters in supermarket, schools, hospitals and other public places are reducing waste and sewage fees and also is an approach to collect manure for biogas plants. Moreover, effective utilization of farmland as an energy resource are likely to increase the share of manure production as agricultural crops has the potential to produce 70% of biogas through anaerobic digestion plants. These initiatives and implementation of biogas technology are increasing the demand for biodigesters. European Commission launched a mandatory regulation for all member states that the share of transport fuels from biofuels or other sustainable sources be increased to 10% minimum by 2020. Moreover, as per the U.S. Renewable Fuel Standard it is mandatory to gain a nine-fold increase of biofuels production from 15 billion liters in 2006 to 136 billion liters by the end of 2020. These government initiatives are contributing in the adoption of bioenergy or biogas solutions and eventually boosting the adoption of biodigesters across the globe. However, underground installation of digester in flood prone is a major concern for the consumers. Failure of such structure may cause harmful and uncontrolled release of biogas which may cause hazardous situation which is restricting the adoption of biogas systems and hampering the growth of biodigesters. 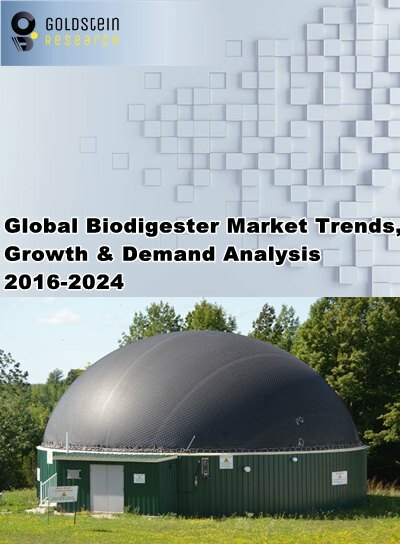 Global biodigester market is projected to reach USD 6.1 billion by 2024, registering a CAGR of 8.40% during the forecast period. Rising investment for the installation of biogas plants to utilize biological waste material for energy generation are anticipated to increase the demand for biodigesters. Asia-Pacific region shows dominance in global biodigester market owing to its huge implementation of small-scale biogas plants or digesters in the production of bio-methane gas for cooking and space heating in developing countries such as India, China, Thailand, Indonesia and Mauritius. Over 100 million of rural populations of China are accessing energy which is produced by bio gas plants. Rising demand for electricity, mainly in rural areas of emerging economies are expected to drive the growth of global biodigester market. Rhodia acquired Econcern Group’s for six pilot biogas production projects located in China and Vietnam and are aiming to gain huge profit through investment in biogas technology. Such initiatives and acquisitions are contributing in the growth of biodigester market. Global suppliers and manufacturers of biogas plant equipments are expected to gain profit out of growing demand for components, services and chemicals for biogas plants. Increasing number of small suppliers and manufacturers for process equipments for biogas power plants are likely to contribute in the expansion of global biodigester market in the near future. Increasing carbon taxes to reduce the use of fossil fuel and to increase the energy efficiency is an effective initiative taken by government to promote the adoption of biodigester for generating bioenergy. For instance, Sweden, have successfully implemented the carbon tax leading to an increase use of bioenergy. However, biogas leakage is restricting the adoption of biogas systems by residents and public places such as schools and super market. Lack of awareness and rigidness towards not to set up a biogas plant in their own backyard is inhibiting the growth of biodigester market. Moreover, health hazards associated with the handling of sludge and untreated human excreta which are used for anaerobic digester in rural areas are also hindering the adoption of biodigesters. Global Fuel Cell Market Size, Share, Trends, Growth opportunities, Restraints, Key players & Demand Analysis by Fuel Cell Type & By Fuel Cell Application with Regional Outlook & Forecast to 2024.